EDMONTON (April 1, 2019) – Alberta's Primary Care Networks have joined forces to make it quicker and easier for patients to find a family doctor. Albertans can visit www.albertafindadoctor.ca on their mobile, tablet, laptop or desktop computer to find out which physicians are currently accepting new patients. Research shows that patients who regularly visit a family doctor and team are healthier, live longer and are hospitalized less. “The Find a Doctor website makes it easier for all Albertans to find a doctor and health team to help them build a healthier future,” said Calgary family doctor Dr. Ernst Greyvenstein, Primary Care Networks physician lead for the Calgary Zone. 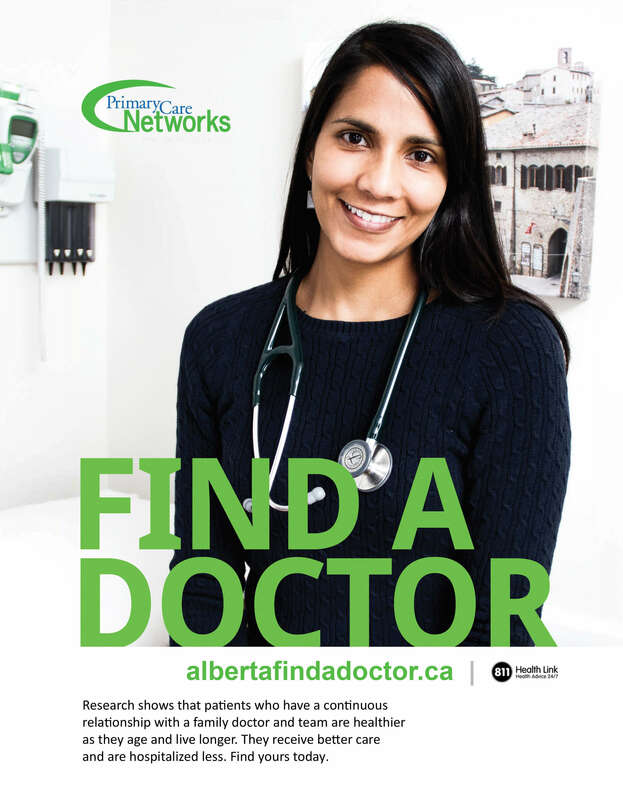 Alberta Find a Doctor, built by PCNs in partnership with family doctors and Alberta Health Services, brings together separate services that previously existed in Calgary, Edmonton and other parts of the province. The website lists physicians by location and, where possible, by gender and languages spoken. It is free to use and can also be accessed by calling Health Link at 811. "Research shows that patients who regularly visit a family doctor and team are healthier, live longer and are hospitalized less." In Alberta, most family doctors are members of Primary Care Networks. PCNs develop programs and services to help meet the everyday health needs of the patients and communities they serve. They work alongside more than 3,800 family doctors and 1,400 other health professionals -- including nurses, pharmacists, mental health therapists and social workers -- to provide team-based care. There are currently 41 PCNs in Alberta. A report released by the Canadian Institute for Health Information (CIHI) in 2017 showed the number of doctors in Canada – as well as the number per population – has risen for 10 consecutive years. Alberta reported the largest jump in 2016 at 5.2 per cent. Although the number of family physicians taking patients can vary from community to community and region to region in Alberta, www.albertafindadoctor.ca shows hundreds of family physicians in both rural and urban areas are currently taking patients. Because the new provincial website is interactive, there are no delays or long waits. The listings are updated regularly to ensure the data is as up-to-date and as accurate as possible.